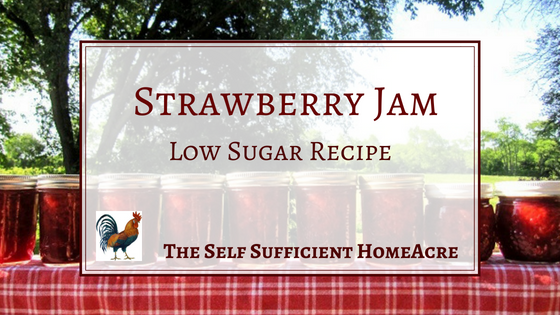 This delicious low sugar strawberry jam recipe will satisfy your sweet tooth without overloading you with sugar! Are you sick of jam recipes that call for more sugar than fruit? Me too! I have a sweet tooth, but some jams are just too sweet for me. So I started using a no sugar needed pectin using the low sugar instructions. Well, okay…I don’t actually follow their instructions. They call for water or juice to be added, and I prefer mine made with all fruit for more intense strawberry flavor! 1/4 tsp butter or margarine to reduce foaming, if desired. Wash 1/2 pint jars (10) and sterilize for 20 minutes in your hot water bath canner. Follow manufacturer’s instructions for preparing canning lids and screw bands. Crush strawberries and place in large stainless steel pot. Mix 1/2 cup of sugar into small bowl and add pectin. Combine thoroughly and add to crushed berries. Combine well. Measure remaining sugar into another bowl. Cook berry mixture on medium high until it comes to a rolling boil (can’t be stirred down). Add sugar, all at once and stir. Add butter or margarine to reduce foaming, if desired. Bring back to a rolling boil. Boil for 1 minute, remove from heat, and skim foam. 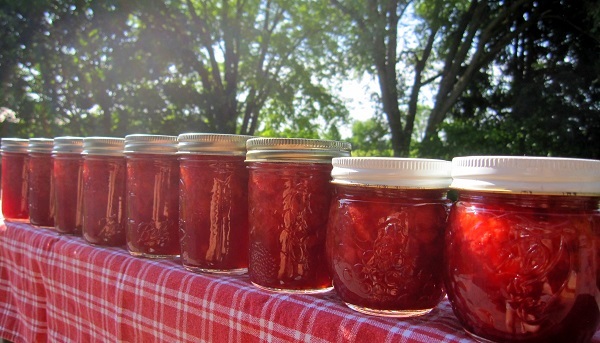 Ladle jam into hot, sterile jars, leaving 1/4″ of head space. Wipe rim with clean cloth, center lid on jar, screw on band (fingertip tight). Use jar lifter to place filled jars in boiling water bath, with at least 1-2″ of water over jars. Process for 10 minutes, adjusting for altitude. Remove jars from canner with jar lifter and place on a towel to cool. Check jars for seal after 24 hours. Jars that do not seal should be refrigerated and used in 3 weeks. Makes 10 half pint jars of jam. I’m very happy with the Realfruit Low or No Sugar Pectin from Ball. I buy it in a 4.7oz plastic container that makes 22 half pint jars of jam. There are other options for low or no sugar pectin, and they should work just as well in this recipe as Ball pectin. 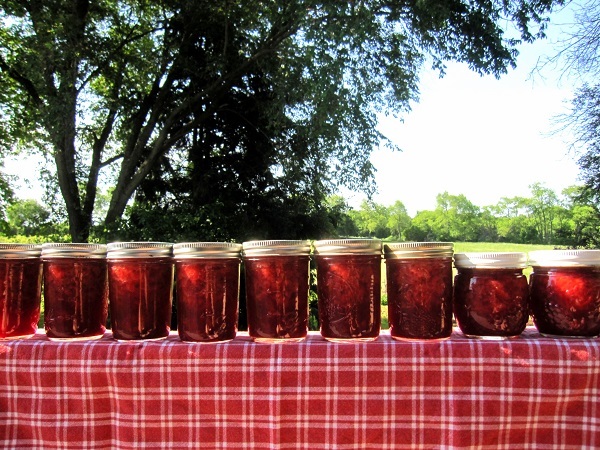 Full disclosure here…I’ve never tried making my jam without any sugar, so I can’t vouch for how good it will taste. 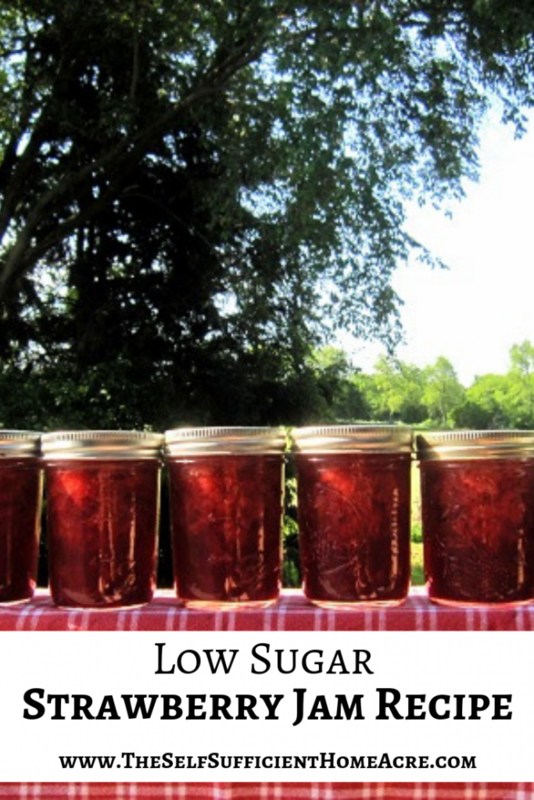 The low sugar recipe is the only one I use for jam now, it’s that good! 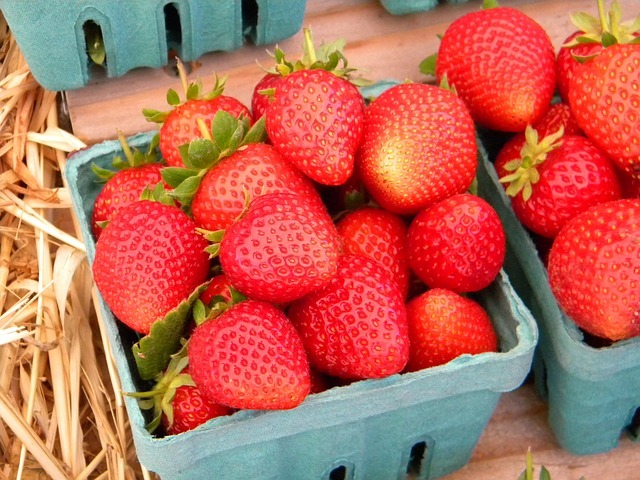 Strawberries: Nutrition, Benefits, & Uses – Over 30 Ways to Use Them! This site is a participant in the Amazon Services LLC Associates Program, an affiliate advertising program designed to provide a means for me to earn fees by linking to Amazon.com and affiliated sites. You will not pay any extra for these products and I’ll earn a small commission to help support this blog. Be advised that Amazon places cookies on your browser. Full disclosure here, I’ve never used Pomona’s Pectin. But quite a few people swear by it. If you are interested in ordering Pomona’s Pectin through a buying club, check to see if Azure Standard has a buying club in your area. Azure Standard carries Pomona’s Pectin in bulk. Lisa writes in-depth articles about gardening and homesteading topics. She grew up on a farm and has continued learning about horticulture, animal husbandry, and home food preservation ever since. She has earned an Associate of Applied Science in Horticulture and a Bachelor of Fine Arts. She is a self proclaimed gardening freak and crazy chicken lady. In addition to writing for her own websites, Lisa has contributed articles to The Prepper Project and Homestead.org. The author lives outside of Chicago with her husband, son, 2 dogs, 1 cat, and a variety of poultry. Lisa writes in-depth articles about gardening and homesteading topics. She grew up on a farm and has continued learning about horticulture, animal husbandry, and home food preservation ever since. She has earned an Associate of Applied Science in Horticulture and a Bachelor of Fine Arts. She is a self proclaimed gardening freak and crazy chicken lady. In addition to writing for her own websites, Lisa has contributed articles to The Prepper Project and Homestead.org. The author lives outside of Chicago with her husband, son, 2 dogs, 1 cat, and a variety of poultry. Dutch Oven Cooking – Popcorn!